The Pecos River originates high up in the Pecos Wilderness Area of the Sangre de Cristo Mountains just north of Santa Fe, NM. A handful of tiny streams loaded with small browns, cut-bows and cutthroats flow into the Pecos above Cowles. Below Cowles the stream becomes a small-medium river ranging between 10-25 feet wide as it tumbles into the Pecos Box, one of two canyons stretches. Many opportunities exist in this rather large watershed. Portions of the Pecos River proper are fairly wide, varying from 10 to 40 feet, with rainbows the predominant fish. An occasional brown trout is caught and on rare occasion a brook trout has been landed. The Box” is the upper canyon located just downstream of Cowles. The other canyon section is from the Willow Creek confluence downstream to Terrero. Access both canyons by hiking down from the parking areas located along NM 63. These canyon sections feature pocket water, deep pools, plunges and some fast white water. Tight casting quarters require anglers to creep along the bank or work from the middle of the river making short casts underneath the overhanging willow trees. These canyon sections are teeming with rainbows and wild browns ranging from 8-14 inches. Larger trout are few and far between but do exist. Leaving the town of Pecos traveling upstream for about 12 miles to the community of Tererro, the Pecos River follows NM63 and is heavily fished near the campground. But, if you can find an open spot on the river, fish it! The Pecos River cuts through private property in many places along the way. Traveling north of Tererro on NM 63 for about 2 miles is the confluence of Mora Creek and the Pecos River at Mora Creek Campground. The campground area receives a tremendous amount of fishing pressure. Try hiking up Mora Creek about one-half mile to some good brown trout water. Mora Creek opens into the Mora Box about three-quarters of a mile up from the trailhead near the campground. Above the convergence of Mora Creek and the Pecos River the landscape opens up into the Pecos Box–a deep canyon with pools, pocket water, and great riffles–with about one and one-half miles in special regulation waters. Mostly rainbows but a few browns are just waiting to be tempted by the gentle presentation of your fly. Panchuela Creek and Jacks Creek converge with the Pecos River in the far north end of the Pecos area, about 2 miles north of Cowles. These streams offer very good dry-fly and nymph fishing opportunities. Hiking in this area is a must but, it is highly rewarding because of the pristine nature of this forested region. The Pecos River headwaters are northeast of Panchuela Creek and Jacks Creek near a place called Beatty’s Cabin, about a 6 mile hike. Take the Glorieta exit off I-25 north and NM50 to the town of Pecos. Head north on NM 63, which follows the Pecos River. The Pecos River is about 95 miles north of Albuquerque and 45 northeast of Santa Fe. Several key insects are worth imitating throughout the canyon stretches of the Pecos. The first two are stoneflies, the Giant Stonefly (Pteronarcys californica) and the Golden Stonefly (Hesperoperla pacifica). The Giants begin hatching in late May and continue through mid to late June. The Goldens soon follow in early to mid July. Nymphing along the bottom in the deep pools and runs is the most consistent technique. Look for rising trout in the edge water and pockets, these trout will some times come up to a beefy adult stonefly pattern even when they don’t appear to be taking flies off the surface. During the middle of the summer mayflies make their biggest showing. Red Quills or March Browns (Rhithrogena) begin hatching in late June/early July and will often continue hatching until late August. Once again nymphing is the best technique to catch fish throughout the day, a #14 Hare’s Ear is a good imitation. By July the caddisflies make their presence known. Two main species exist, one is a green free-living caddis (Rhyacophila) and the other is the tanish/olivish Brychycentrus. Green, olive and tan caddis larva and pupa patterns in sizes 12-16 work best when trout aren’t taking adults. Olive and tan Elk Hair Caddis (#12-16) makes great imitations when trout are slashing the surface. The Pecos fishing season usually runs from April to late September. Runoff starts anywhere from late March to early May and can last through June. During normal years good flows exist throughout most of September, however drier years make for a short season. This is not a winter fishery by any stretch of ideas, snow and ice covers much of the river throughout the winter. 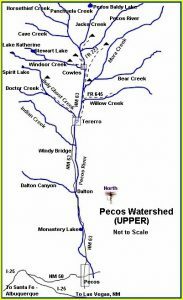 There are two areas on the Pecos with Special Trout Water regulations. Fly fishers seeking isolation, solitude and a bit of adventure might consider the upper reaches of the Pecos or one of its tiny headwater tributaries located in the Pecos Wilderness Area. These streams are all small ranging between 3-10 feet wide and require anglers to hike. Aside from the lack of people anglers can find brightly colored wild browns and a few native Rio Grande Cutthroats, New Mexico’s state fish.